- Where do I begin with this one??!! Might as well start with a short summary of my hiking journey over the past twenty-eight years. 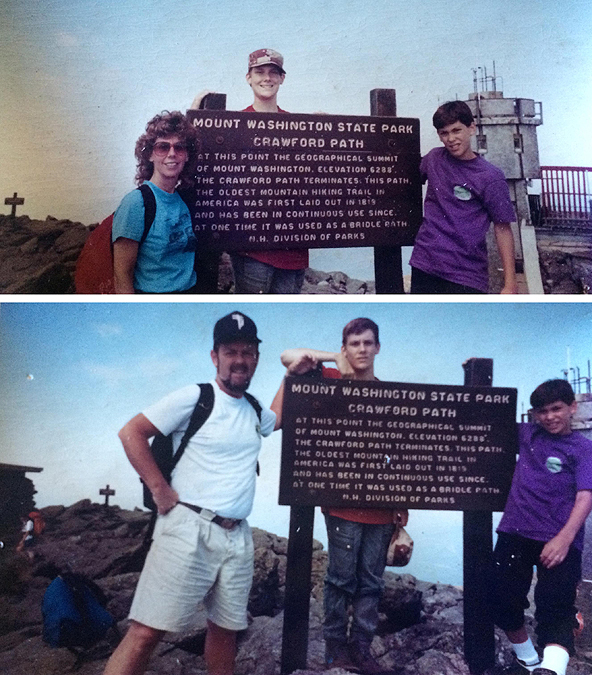 My first 4,000 footer was Mount Washington on August 31st, 1988, I was nine years old and was with my parents and my brother, Joe-Ben. The day before we hiked up to Lakes of the Clouds and stayed in the hut for the night before summiting the following day, back then the huts were very affordable for a family of four and a joyful experience. Over the next several years we would take family trips to New Hampshire and hike mountains of all sizes in the White Mountains. However, the hikes I remembered the most were the ones that went above 4,000 feet, and those stuck with me after I left for college and all but stopped hiking. Meanwhile, my parents continued to hike and backpack for several years with Teddy the Golden Retriever all over the trails in the Whites. 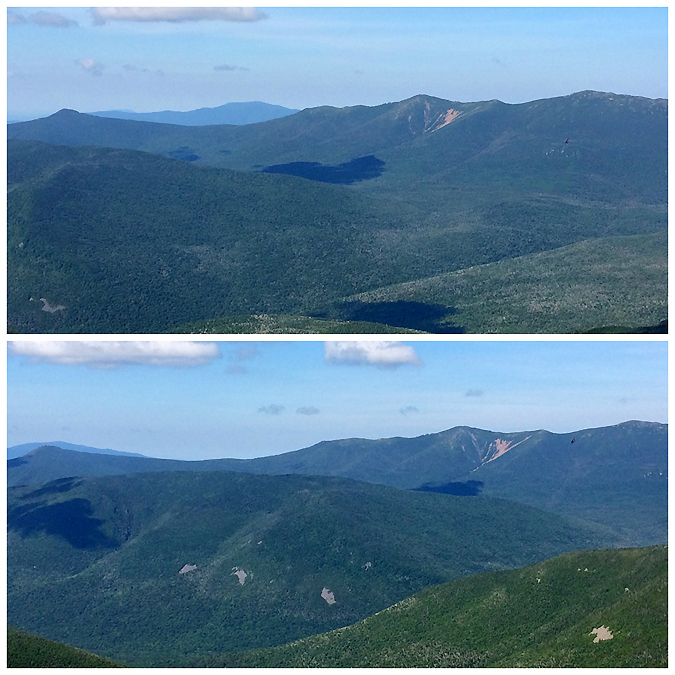 Eventually, I made it back up to the mountains in my late twenties and began retracing their footsteps, first completing the 48 - 4,000 footers, then taking the trails less traveled in the Pemigewasset, Great Gulf, Dry River, Sandwich, and Wild River wilderness areas. Within time I started creating my own path as I acquired more knowledge about the history of these mountains and the trails surrounding them. This, along with morphing into a hybrid hiker/trail runner allowed me to attempt some physically demanding hikes/runs that I have come to know and love. 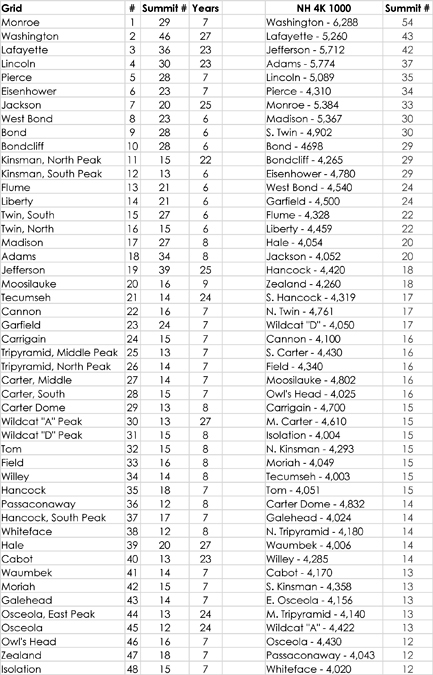 After several years of consistently hiking, those 4,000 foot peaks added up and and about a year and a half ago I found myself within striking distance of completing the Grid (hiking the 48 - 4,000 foot peaks in every month, more details here). Over the past eighteen months as the Grid peaks whittled away I noticed that if I was still able to get in non-grid hikes that I would also be closing in on 1000 NH 4K's around the same time as my Grid finish. So with that dual goal in mind I began planning a route that would be physically brutal but beyond rewarding, hence a Hut to Hut Traverse with Owl's Head and Isolation added in! - Wednesday morning I drove the Jeep to Nineteen-Mile Brook trailhead and walked 5.5 miles back to my house via the Great Gulf Link, Dolly Copp, NH 16, and the Stony Brook neighborhood, eliminating most of the walk along the busy NH 16. As the day crawled along I kept checking the weather to make sure the skies would be stable and I wouldn't get caught in late afternoon thunderstorms as I slogged across the northern Presidential Range. Once I was comfortable with the extended forecast I tried to get some shut eye before heading out at dark o'thirty in the morning. - 12:30AM I left Gorham driving Whitney's Subaru Crosstrek, it was a nerve racking drive to say the least as I saw three moose on the way to Franconia Notch just standing on the side of the road, one of which was a huge bull moose. I could barely see them until I was close by, too close for my blood so I made sure to drive slow as it would have been an epic failure to not even make it to the start of my hike and ruin Whitney's car! - 1:30AM I slowly make my way 1.2ish miles to the Lonesome Lake Hut from Lafayette Place Campground. It's a very easy hike to the hut, basically you are hiking up a dirt ramp, and I reach the hut just after 2AM waking up a few A.T. thru-hikers who are sleeping in the dining area. I sign the guest book, turn on my GPS watch, step outside, take a deep breath, and I'm off at 2:07AM. - The weather is perfect, in the mid 50's as I jog back down to Lafayette Place and head under the highway to the Old Bridle Path and start my first major climb of the day. It's 2:30ish in the morning and the air is still in the woods but I can hear the wind gusting lightly up above. 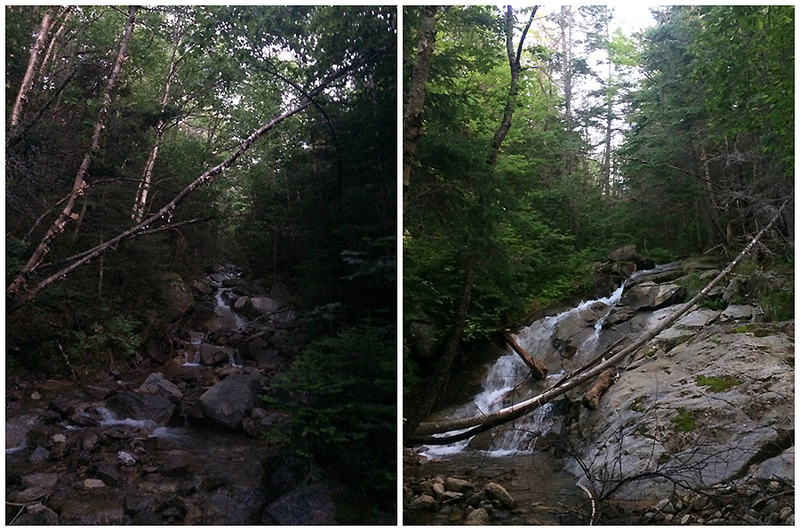 Old Bridle Path is one of the heaviest used trails in the White Mountains so it's extremely easy to follow in the middle of the night. The trail has a consistent moderate grade and decent footing with only a few short steep bursts as it makes its way along Agony Ridge to Greenleaf Hut. 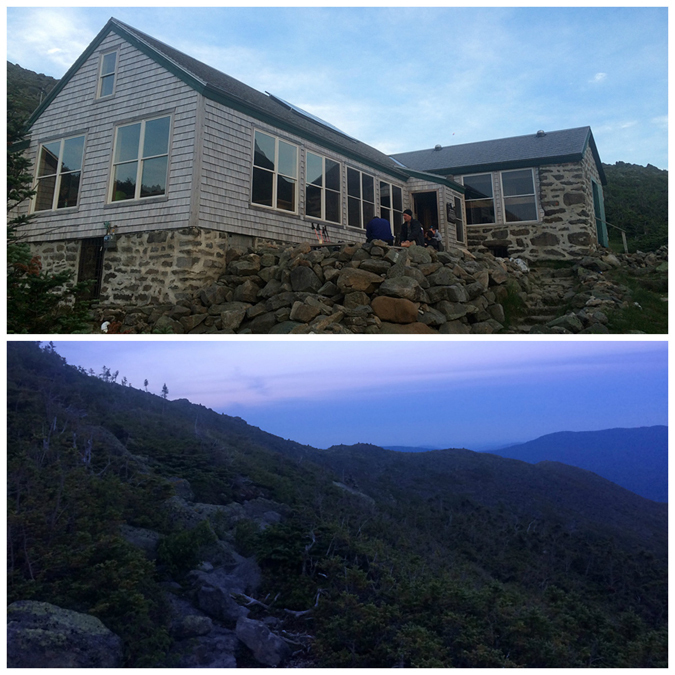 - 3:44AM I make it to Greenleaf Hut and refill my water, prepare my fuel (gels, gummies, food), and put on my long sleeve shirt for the climb up to Mount Lafayette. The wind is gusting at a decent clip but it felt great with the temps holding strong in the high 50's above treeline. The climb up to Lafayette as 4AM passes was incredible as there was barely a cloud in the sky. The almost full moon illuminates the rocky path so much so that I was able to shut off my headlamp and travel by the moon's brightness, which is a pretty awesome thing to experience! - As I summited Lafayette I broke away from the standard H2H route, instead of heading left onto the dreaded Garfield Ridge Trail, I bang a right and head over to a sub peak between Lafayette and Lincoln, referred to as Mount Truman or North Lincoln. I'm making good time, but it's too fast as I will have to drop in on the Lincoln Slide before twilight. Luckily, I have been on the Lincoln Slide four times and was there last month so I wasn't too worried. I did turn the headlamp back on as I navigated safely over a faint herd path that leads to within one hundred feet of the slide where there is some thick scrub to navigate. At this point I lowered myself carefully down 'the rock' and through the scrub tunnel popping me out at the top of the slide, nothing to it! - The Lincoln Slide is a monster, it's huge, but is not steep and not difficult if you take your time descending it. The upper half of the slide is loose rocks and gravel, this funnels into the lower half where the stream begins and slab and huge boulders become present, but the footing is easier to contend with than the loose upper half. - I caught sunrise from the slide and soon enough turned my headlamp off as I hopped my way down to the bottom of the slide and into the woods. From the foot of the slide I carefully made my way along the stream, heading off into the woods when the stream was un-walkable. The vegetation is thick around the stream so I stayed in it as much as I could until the last 0.75 miles when the woods open up and the bushwhack along the left bank becomes easier. I followed this to the streams outlet which is just below a beautiful cascade along the Lincoln Brook about one hundred feet below the Lincoln Brook Trail. - I was happy to be done with the bushwhack portion of the hike and other than wet feet and a hole ripped in my shirt it went pretty well. 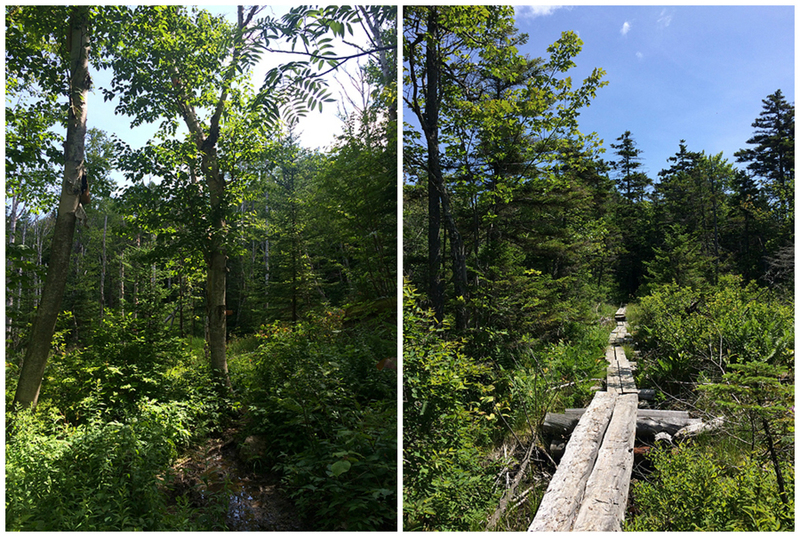 The whack dumps out just over a half mile north of the Owl's Head Path, but the trail is relatively flat and I was at the start of the path within ten minutes. The Owl's Head Path heads up the Owl's Head Slide, it's a relentlessly steep climb up to the summit and can be demoralizing as the slide, the fun part, is not that long and is followed by steep in-the-woods hiking. - 6:26AM I reach the summit of Owl's Head and take a five minute break to organize my fuel for the hike/run to Thirteen Falls. Back down the slide I go and then take the Lincoln Brook Trail north over a small height of land and then down to Thirteen Falls. The trail just past the slide is becoming more and more faint to the height of land, once past this it becomes easy to follow but is wet and muddy for half of it. 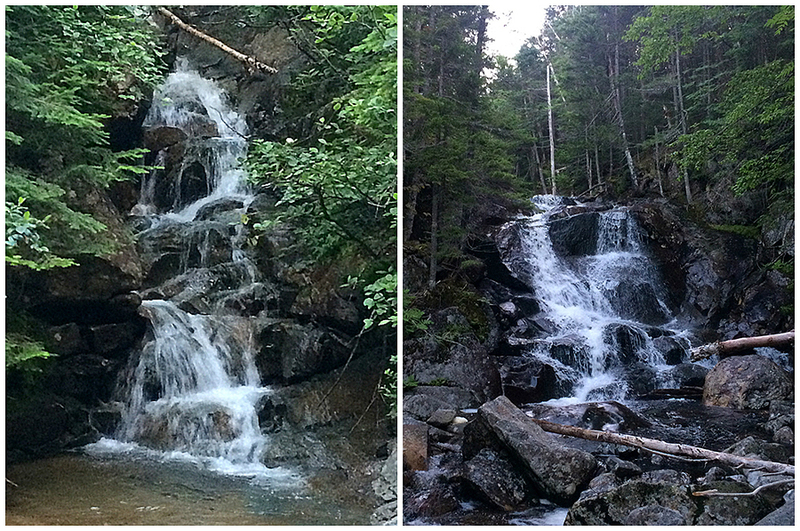 I felt good and was able to trail run to thirteen falls, stopping at a brook crossing to refill my water for the following climb up Twin Brook Trail to Galehead Hut. - The Twin Brook Trail has easy grades and great footing until the last half mile so I was able to motor up it quickly to the hut where I finally saw the first hikers of the day milling around the hut. - 8:37AM Galehead Hut, I refill my water and prepare my fuel. I take a ten minute break to get ready for the 0.8 mile and 1,200 foot plus elevation gain up to the summit of South Twin via the Twinway (A.T.). One of the hut croo asks what I am doing and gives me a puzzling look when I inform him of my route! - The steep burst up to South Twin over the rocky terrain goes well, I'm coming across several hikers now which makes me feel more comfortable knowing there are other hikers out and about, I imagine they all are doing something crazy like me which puts a smile on my face. - When I pop above the scrubby trees on South Twin's summit the sun is shining brightly but there is barely any wind, it's getting hot and it's only going to get hotter so I keep on moving along the Twinway over to the Guyot Range. The two miles to the Bondcliff junction go by quickly as the trail is built for speed as it navigates through a pretty section of the trail. When I reach the Bondcliff junction I take a left and stay on the Twinway for the drop into the Guyot / Zealand col. The trail is rocky and the footing isn't that forgiving on the drop into the col but I felt really strong and rock hop quickly down into and out of the col and reach Zealand's summit at 10:06AM. - As I'm taking a short break I hear a voice saying my name, it's my friend Denise! I was thrilled to see her as she just recently hurt her ankle and I was wondering if she was back hiking yet. It was a nice break to take for a couple of minutes and catch up with Denise before I made the fast descent over good footing to Zealand Falls Hut. - 10:54AM Zealand Falls Hut, I do the usual refilling and fueling while chatting with one of the hut croo who is making brownies and is kind enough to give me some left over crumbs. From the hut I have to gain the Tom / Field col of the Willey Range via the A-Z Trail, this is a grind doing the H2H up from Crawford Notch but is very easy coming from this direction as it's not steep until the last few hundred feet and the footing is very forgiving. I maintained a great pace to the col before running down to the halfway point at the Highland Center located at the top of Crawford Notch. There were quite a few people out but not too many like there would be on a weekend. - Halfway point, 30 miles in at 12:37PM in 10 hours and 30 minutes. I'm an hour ahead of my estimated time, I'm thrilled and take a fifteen minute break organizing my gear and chugging an ice cold soda I bought from the Crawford Depot. I run into another hiker I know, Mollie, who just got down from Mount Willard and is about to head home, I'm a little jealous as I will not get home until tomorrow! - Here goes nothing...the second half of the hike starts with an easy 1.7 mile climb up the oldest maintained trail in the United States, the Crawford Path. When I reach the Mizpah Cutoff junction I bang a right and make quick work of the 0.7 miles to Mizpah Spring Hut. Now comes the grind as I have to drop back down, this time into the Dry River Valley, and then climb back out over muddy and lightly used trails during the mid day heat. 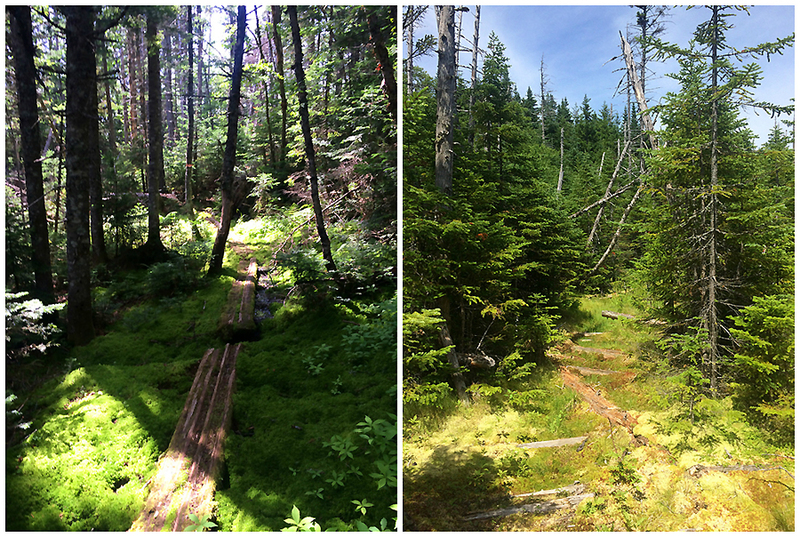 Luckily, I did a recon hike just last week on these trails so I knew what I was in for. The run down to the Dry River along the Dry River Cutoff went well except I fell into the mud twice, which was fine with me since I had another pair of socks that I would change into once getting out of the Dry River Valley. - When I reached the Dry River I started up the Isolation Trail West, this is when I started to slow down, I felt fine but my feet just could not generate anymore speed so my mileage splits spiked more than I wanted them too but I was still enjoying myself. Even with the slow down I soon gained the ridge and the Davis Path, leading to the final peak of the day, Mount Isolation. 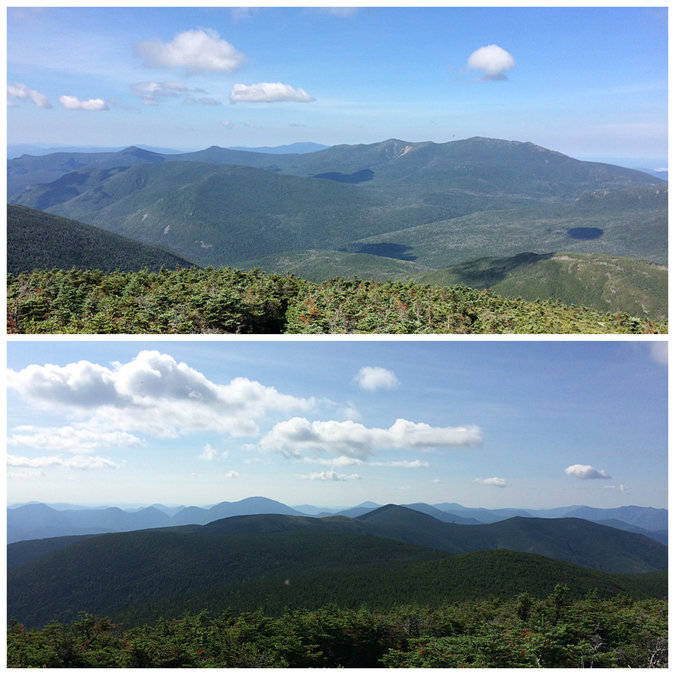 - 3:55PM final Grid peak & NH 4K #1000 summited! It was bittersweet, a lot of thoughts went rushing through my mind for a minute or two before reality set in, I still had twenty miles to go! I changed into comfy dry socks and snapped a summit photo with Mount Washington, the first 4K I ever climbed, dominating the backdrop. 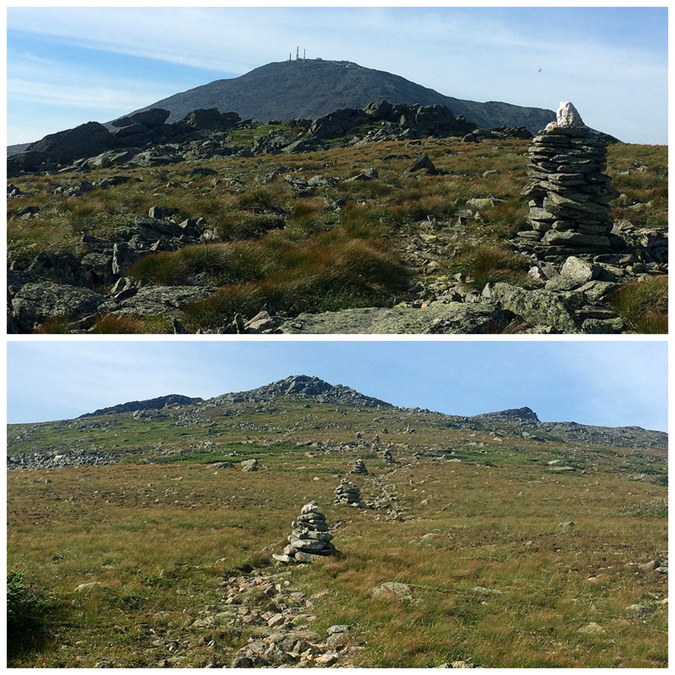 - From Isolation I climbed back up above the trees on the Davis Path over one of the most breathtaking stretches of trail in the White Mountains, the cairns that mark the trail along here are a thing of beauty. The weather was staying perfect and the wind picked up significantly giving me a huge boost after sweating it out below treeline. I had great views of Washington's summit cone as I made my way past the Boott Spur over to the Camel Trail junction. 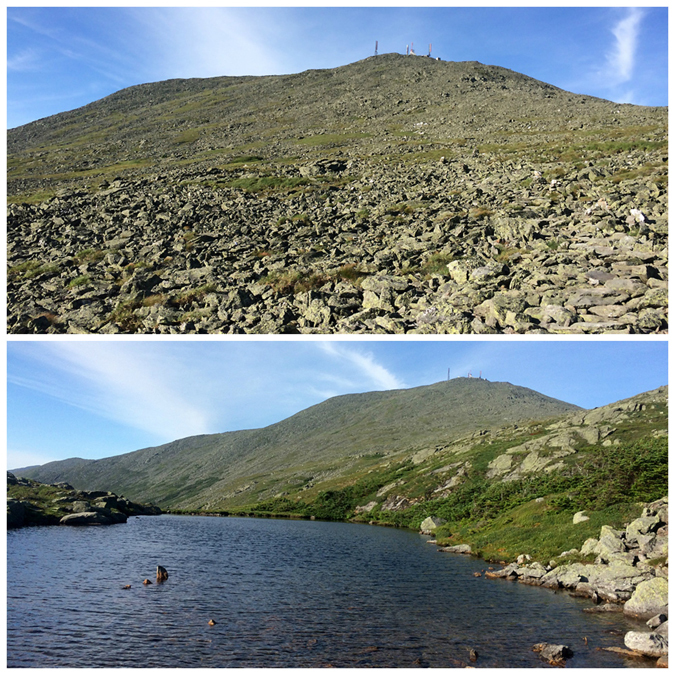 From the junction is less than a mile to Lakes of the Clouds Hut and I rock hopped and jogged as the hut and the rugged profile of Mount Monroe came into view. - 5:43PM Lakes of the Clouds Hut. The hut was booming as dinner would be served shortly, it was controlled chaos at its finest as the hut croo was setting everything up while keeping the guests entertained with a pre dinner skit. 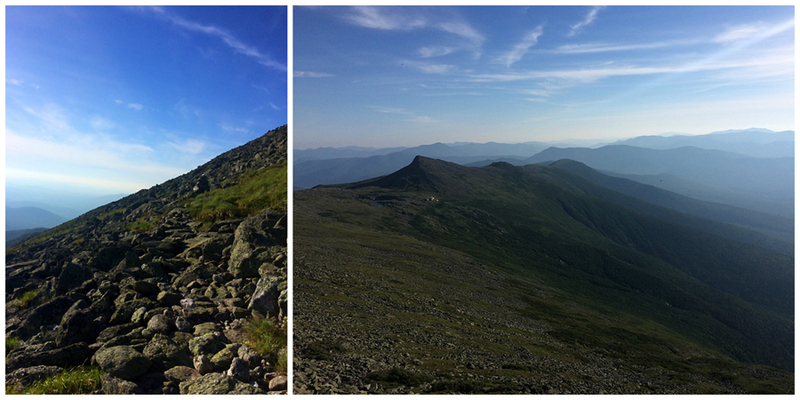 I did the usual, refilling water and organizing my fuel for the next stretch ahead, the Northern Presidential Range. - From the hut I hooked onto the Crawford Path for a mile to the Westside Trail, this section of the Crawford Path is a marvel of trail work over what many refer to as a 'side walk,' the boulders have been meticulously arranged like steps and pavers for most of the mile and a half stretch from the hut to Mount Washington's summit. I kept up a good pace to the Westside junction where I would skirt around the western flank below the summit mass of Mount Washington. It was now past 6PM and the shadows cast from the mountains were growing and the terrain was turning gold as I made my way past the Cog Railroad tracks and around Mount Clay. - Once past Clay I dropped down to the Sphinx Col and then climbed up to Monticello Lawn and passed by Mount Jefferson's summit cone to the east. Mount Adams came into full view in all its awesomeness as the late afternoon light slowly faded away as I made my way down into Edmands Col.
- Now it was time for my last climb in the Presidential Range up to Thunderstorm Junction, a rallying point for hikers for the past one hundred years. This stretch is special to me, it's one of those places that jumps out to me and is what the Presidential Range is all about, knee hammering rocks and rugged beauty! - 8:01PM Madison Spring Hut, unlike Lakes of the Clouds the scene was much more mellow at the northern end of the Presidential Range. The hut croo was outside interacting with the guests as I did the usual, including my LAST refill of water! 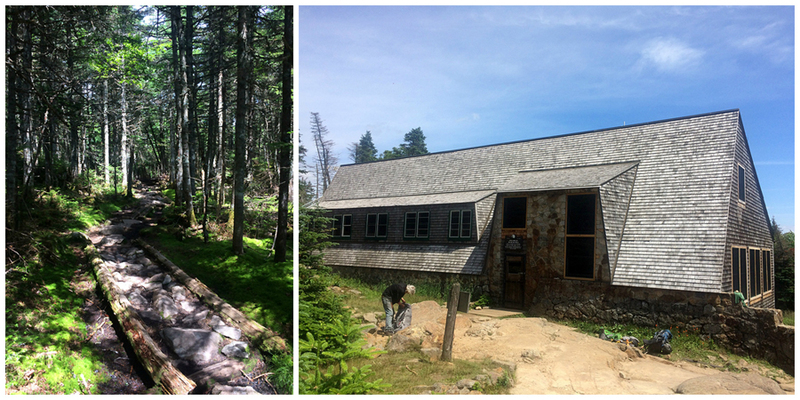 I had a brief but nice conversation with one of the hut croo who wished me luck over the final ten miles to Carter Notch Hut. - I took off from the hut just before 8:15PM and was thrilled that I would not have to navigate the Parapet Trail in the dark. This short trail is as nasty as they get, odd shaped boulders, some that move, along with a nightmarish scrub tree tunnel in the middle with roots, rocks, and holes. Still, it was better than descending the Madison Gulf Trail in the dark. 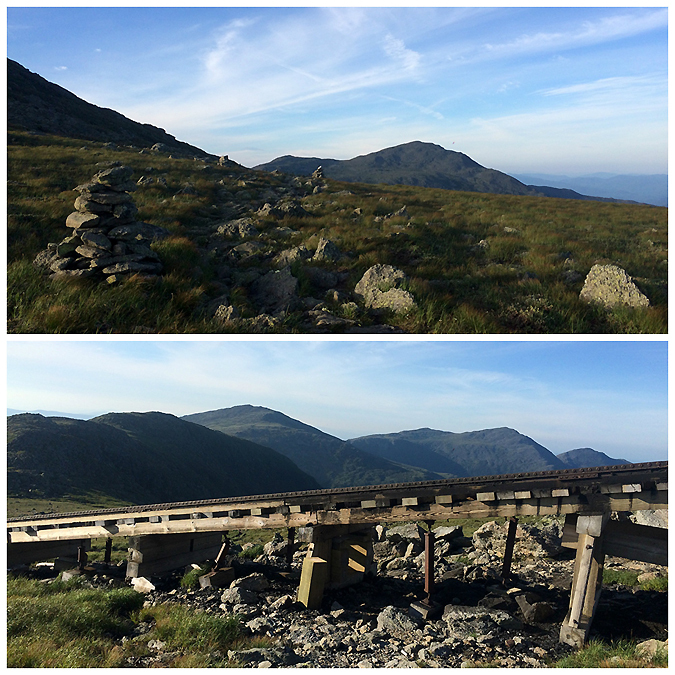 - After carefully picking my way along the Parapet below the eastern flank of Mount Madison's summit cone I arrived at Osgood Junction and into the wind which was now above 35MPH, but still felt great. 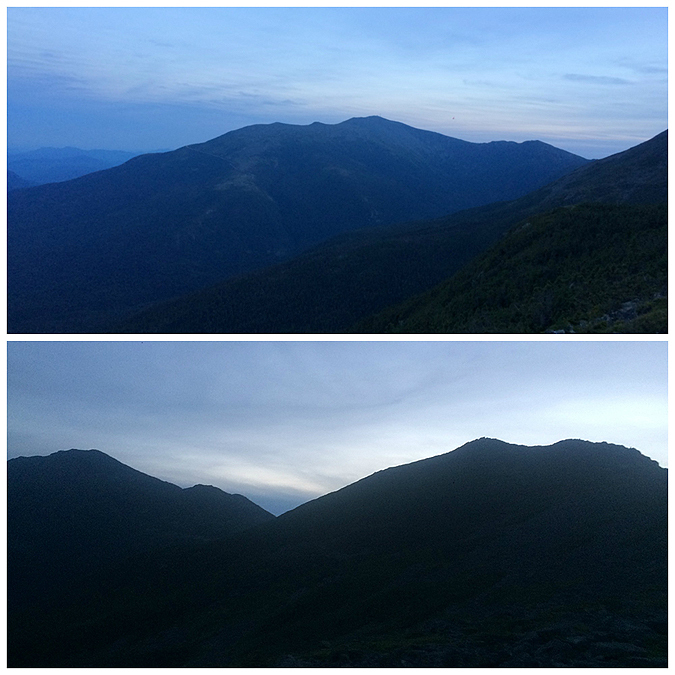 I descended Osgood Ridge as darkness fell all around me but I still made it to treeline before turning on my headlamp. - The Osgood Trail can be broken down into three sections, the first is a nice trail from the Great Gulf Trail just past Osgood Campsite, the second is the steep and rocky approach to treeline, then there is the final section filled with your typical above treeline boulder field. Having done this trail three previous times in the dark on prior H2H's I knew exactly what to expect on my hike to the floor of the Great Gulf. - When I reached the Great Gulf Trail I just kept moving at a quick pace, no running but I was still moving at a great hiking clip considering what I was putting my body through. About a half mile before the trailhead I ran into the last two hikers I would see, they were both singing to keep bears away. I just kept on moving, knowing if there were any bears they'd be a mile up the trail at Dolly Copp Campground sniffing around for left out coolers full of food. 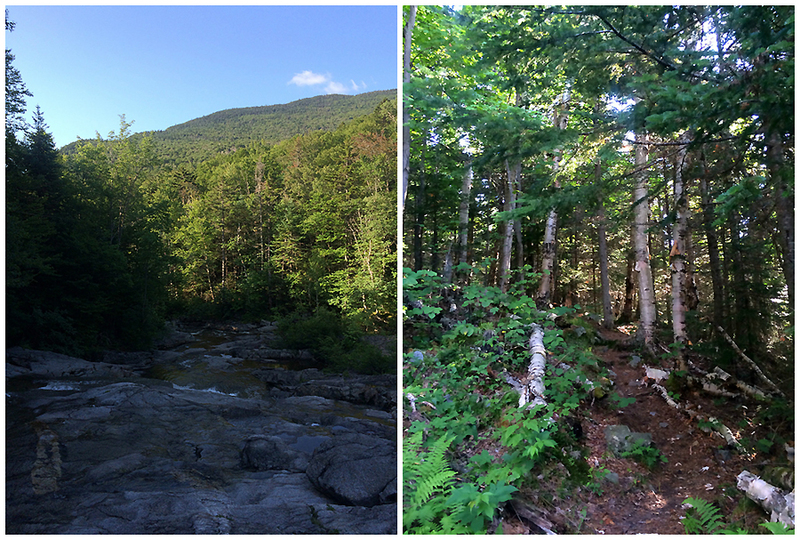 - The Great Gulf trailhead is a half mile from the Nineteen-Mile Brook Trail along NH16. It was close to 10PM and there were several cars speeding by as I pounded pavement between the two trailheads. Walking on the road at mile 56 plus of the day was excruciating! - 10:20PM the home stretch, 3.8 miles and just under 2,000 feet of elevation gain is all that remained. 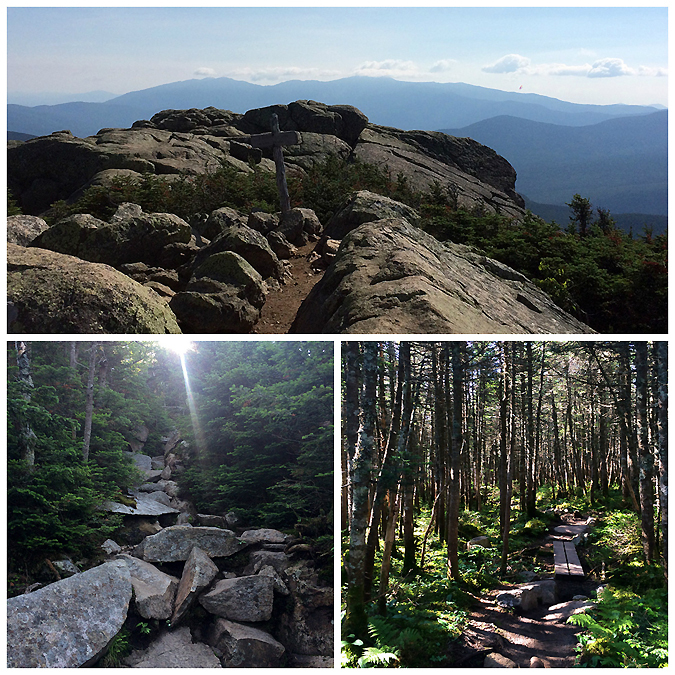 The Nineteen-Mile Brook Trail is heavily used and easy to follow in the dark, the grade is easy to moderate, the footing is on the plus side with the occasional nasty rocky spots but those are few and far between. My knees were tight and the pads of my feet were tender but I was still making decent time as I shuffled my way towards the hut. I passed by the halfway point to the hut, the Carter Dome Trail junction, at 11:10PM and just kept shuffling along. When I was within a quarter of a mile of the hut I finally felt like crap and my knee sent out a quick but intense pain through my leg so I stopped, stretched out my knee, and ate the last of my Cheez-its and was good to go. Within another minute I was at the Wildcat Ridge Trail junction, 0.2 miles to go, this is going to happen! 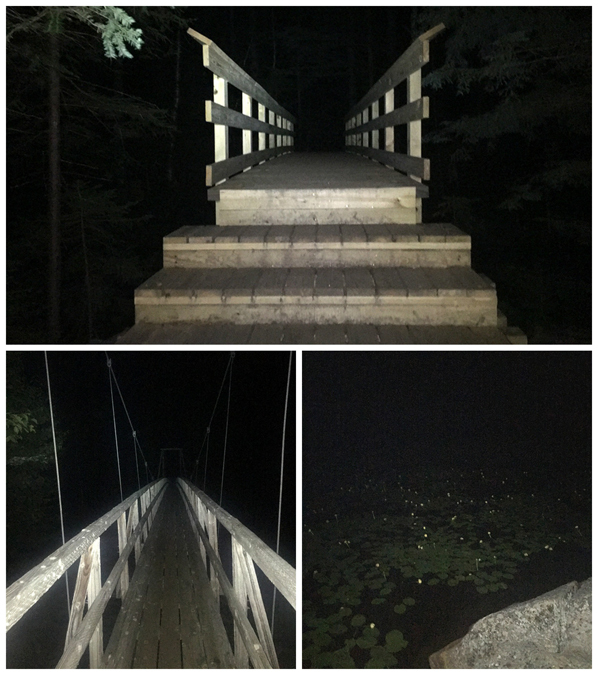 - I rock hopped down to the Carter Notch Pond as dozens of frogs ribbit just a stone throw away, I then skirted along the side of the pond, and rock hopped up to the hut. - 11:56PM Carter Notch Hut, 21 hours and 49 minutes after I left Lonesome Lake Hut at 2:07AM. I sign my last guest book and smile with a great feeling of accomplishment. What a tremendous feeling it was, I just sat on the bench right outside the hut and looked up into the night at the stars, incredible how far I had come on this day and since that day twenty-eight years ago! - After tenish minutes pass by I snap back into action, the bad news is I have to hike back down to the Jeep, the good news is I'm a five minute drive from home once I get there! So I start descending, even jogging a good third of the way...after 1.2 miles up to Lonesome Lake, followed by 60 miles across the White Mountain hut system, I still had enough left in the tank for that 3.8 mile walk out from Carter Notch and make it back to the Jeep in relatively speaking quick fashion at 1:20AM. - I'd like to thank everyone who I have shared the trails with since I was nine years old. There are too many to name but thanks for being part of some great hikes, runs, bushwhacks, slide climbs, and old abandoned trail exploration. Through sun, wind, rain, sleet, snow, ice, clouds, mud, blowdowns, spruce traps, sunrises and sunsets, I've been fortunate enough to spend an absurd amount of time researching and hiking through an awe inspiring mountain range. - To my mom and dad, thank you for driving from sea level in Rhode Island and installing a sense of adventure and love of the mountains, I will always be thankful for taking Joe-Ben and I on road trips with the dog in the minivan to such a magical place. The Twinway (Appalachian Trail) above Galehead Hut, it's pretty rough through this section. Looking down at Mount Isolation, it seems so far away! 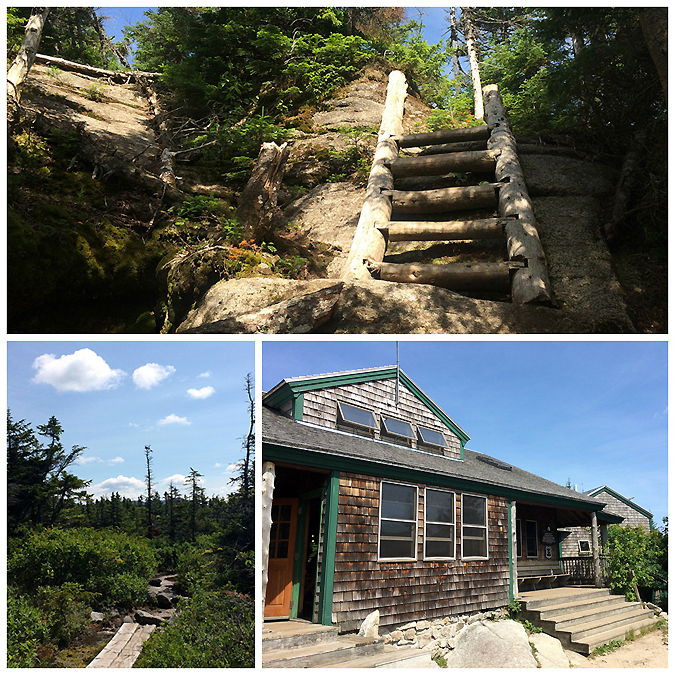 Madison Spring Hut and hiking along the dreaded Parapet Trail! 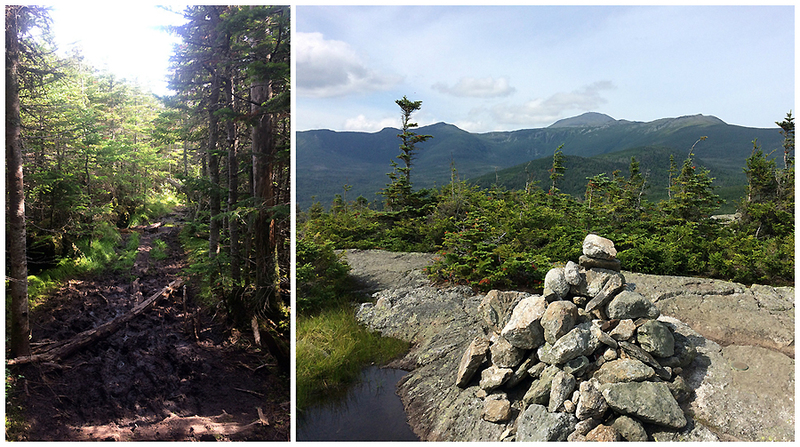 The last above treeline section on the Osgood Trail with my goal, Carter Notch, in view across the notch! Peabody River Bridge, (lower left). 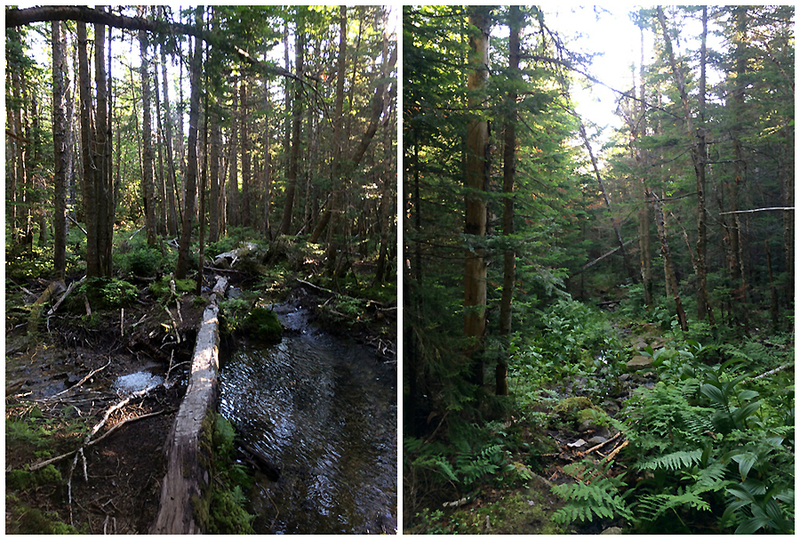 Nineteen Mile Brook Trail bridge (top), and it looks like a bunch of lily pads over taking Carter Notch Pond! What was in my pack and pockets along the way. I switched out the honey bun for a zip lock bag of Cheez-its and pizza combos which came in very handy. 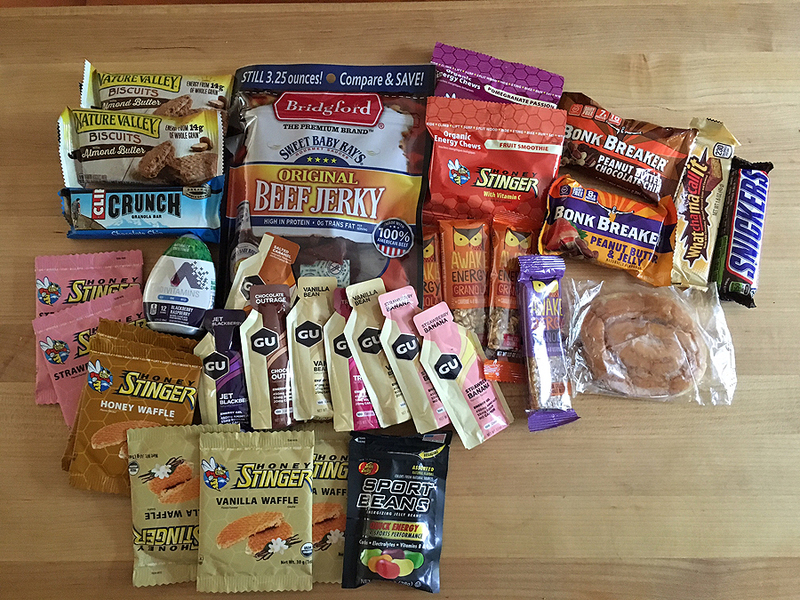 Consumed pretty much everything on here except for a few of the gels, they really weren't getting the job done. My mouth felt odd the next day from all the constant eating and god-only-knows-what is in half theses things that my teeth and gums most likely did not appreciate! Shoes worn, La Sportiva Bushido. I named them the 'Pacific Grove Monarch Butterfly', because I'm amazed at the precise migration from Mexico to Canada they (generations of butterfly) make annually (read more here), reminds me of the generations of hikers who do the H2H / Presi Traverse / Pemi Loop, etc. I've been wearing this brand for about three years and they are incredible. They hold up well over the rugged terrain and the grip is excellent. 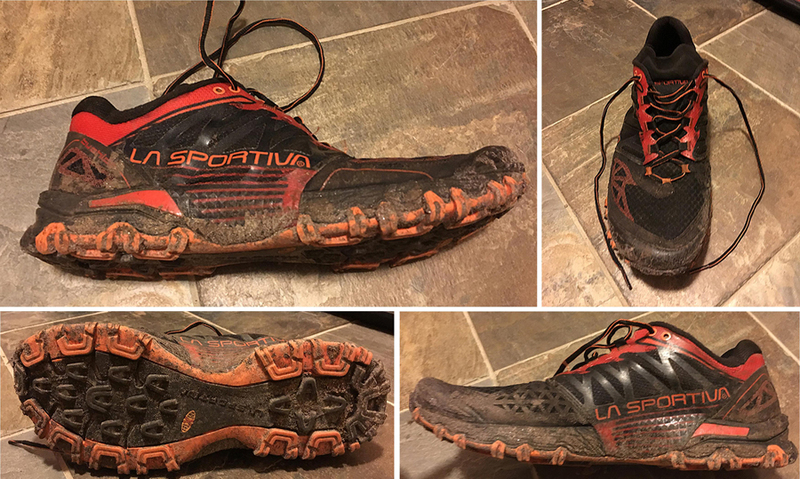 However, if I wasn't 'running' the H2H, or likewise ultra hikes, I would wear the La Sportiva Ultra Raptors because they are more comfortable, albeit heavier. 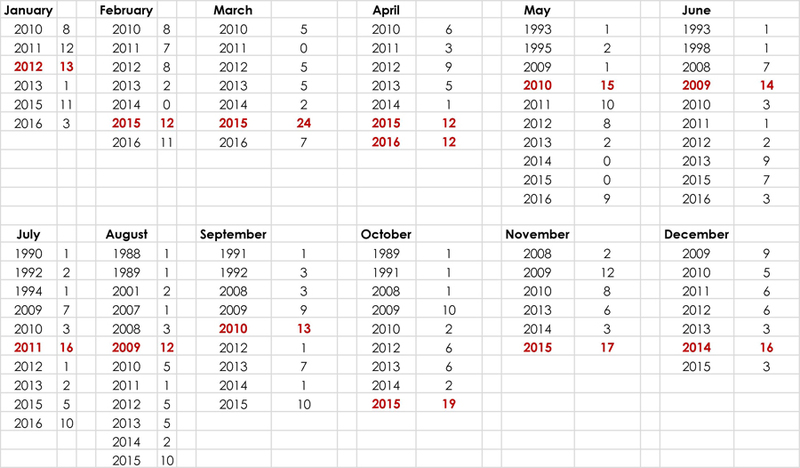 Monthly break down by number hiked in each year, As you can see the bold is the year I hiked the most peaks in that given month. Hike #1!!! August 31st, 1988. That's my brother Joe-Ben behind the sign and that's me to the right, don't I look thrilled! Interesting thing about the sign, this used to be the summit sign, now it's the small one that says Mount Washington. This sign is now located about twenty feet away below this rock pile. Wow!! Thank you for this. The "blow by blow" really brought your journey to life for me and I really enjoyed it. What an amazing accomplishment and I am so proud to have hiked even a little with you over the years. The possibilities are endless for you! Chris, Congratulations on your grid finish! What a hike to end with and perfectly coordinated for #1000. Reading your endurance trip reports inspired me to start pushing for harder hikes after my first round. Happy Trails. A huge congratulations to you! I knew you would come up with something spectacular for your grid finish. May you continue to walk (or run!) 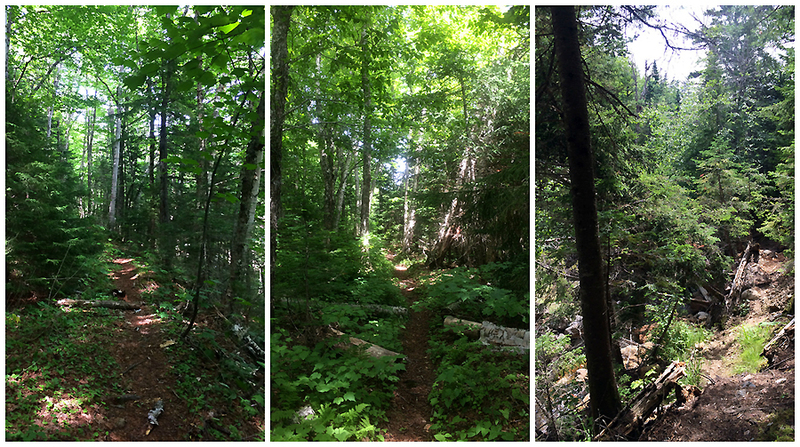 the trails in our mountains and continue to inspire for years to come. Congrats Chris! What a unique, audacious finish to your grid! Very creative. :) And your 4th hut traverse?! Wow. It's amazing how many photos you take. Always love the sign collages! Chris, long time reader here just wanting to send big congratulations to you on this achievement. Your trip reports and photos have been so helpful in inspiring my own hikes. Rooting for you in your future adventures! See you out there! Thanks, Ryan!! Glad you enjoy the reports and photos and they give you some ideas on future hikes, much appreciated. Have a great rest of the summer out there hiking! Congratulations and WOW is all I can say. What a great way to complete the grid with such an epic hike. Congrats Chris on a great Grid finish. I really enjoy reading your trip reports and pictures. I look forward to reading more of them.